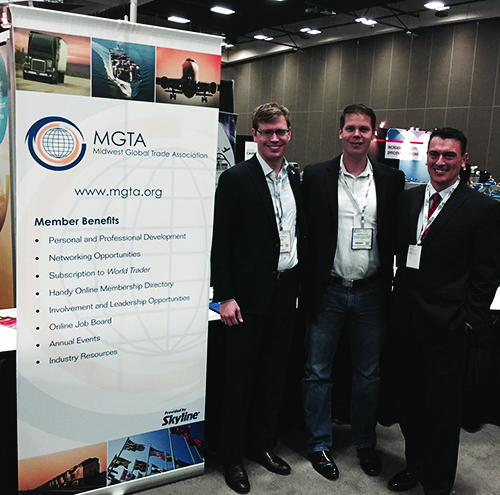 Two weeks ago, I attended the Cargo Logistics America Conference in San Diego. Board member Jason Lloyd and I each had the opportunity to speak on panels discussing the challenges and opportunities of Midwest importers and exporters, challenges such as equipment availability and mode optimization. This event served as a great venue for networking with potential members as well as our cooperating organization partners, the Midwest Shippers Association and the North Dakota Trade Office. Though attending events such as these require commitment of time and resources, they are an excellent way for us to expand our footprint, and bring additional visibility to our organization. As my time serving as president of the MGTA comes to a close, I’d like to thank you all for the opportunity to serve. We’ve made great progress in 2015 in growing our organization, growth that we expect to continue in the coming year. I am very pleased to say that we have an excellent leadership team in place for 2016, led by incoming President Kylle Jordan. I encourage all of you to attend our annual meeting on February 4 to network with the leadership team and everyone involved in contributing to the success of the MGTA. Have a safe and happy holiday season! Member Networking Lunch, "Update on Ex-Im Bank’s Reauthorization"
WTO Rules that Canada and Mexico May Impose $1bil in Retaliatory Tariffs Against the U.S.
On December 7, an arbitration panel of the WTO’s Dispute Settlement Body (DSB) ruled that Canada and Mexico may impose retaliatory tariffs against the U.S. of up to $781 million and $228 million respectively. In May, the WTO Appellate Body found that COOL does not comply with U.S. international trade commitments. For background on the issue of COOL, please see our December 2013 World Trader. Prime Minister Justin Trudeau says he's prepared to impose retaliatory tariffs on U.S. goods if Congress fails to repeal labelling laws that have complicated Canadian meat exports. "We would rather not have to engage in retaliatory measures — but we certainly will, to stand up for our farmers… We're going to work with Americans — or against them — to make sure that it happens," he stated. Canada is getting support from some powerful American corporate interests. About 250 U.S. companies and trade associations have sent a letter to every member of the U.S. Senate, urging them to heed Canadian and Mexican concerns. It's signed by some of the country's best-known companies, including Coca-Cola, Kraft and General Mills, as well as trade associations representing everything from livestock producers to vineyards. Rep. Kevin Cramer, R-N.D., called for COOL's repeal, "if it wasn't already obvious, this decision by the WTO to allow Canada and Mexico to levy $1 billion of retaliatory tariffs on U.S. producers and small businesses should serve as the ultimate reality check,” he said in a statement. "I hope the U.S. Senate acts quickly to pass HR 2393, the Country of Origin Labeling Amendments Act and help prevent these and future tariffs from being imposed." A list of items on which Canada may retaliate was created in June of 2013 and is available at http://www.international.gc.ca/media_commerce/comm/news-communiques/2013/06/07a.aspx?lang=eng. Please note that at publishing deadline this issue had not yet reached a vote in the House or Senate. 2015 was one of the busiest years over the past decade in regards to mergers and acquisitions (M&A) in the transportation and logistics industry. This is presenting a number of opportunities and challenges to providers and customers alike. The first three quarters of 2015 a total of 846 transactions worth $76.55 billion, with the average deal worth $90.48 million. This is the highest level of transportation and logistics M&A activity in terms of value since 2006 according to PwC. Smaller “mom and pop” operators decide to cash out, rather than invest in fleets and attempt to find increasingly scarce driver talent. U.S.-based XPO’s $3.5 billion purchase of a 67 percent interest in Groupe Norbert Dentressangle. XPO Logistics also agreed to acquire Con-way for $3 billion. The combined entity is expected to make $15 billion in revenues and will be the second-largest player in the LTL segment. We can expect to see more M & A. According to Benjamin Gordon, a managing partner in BG Strategic Advisors LLC, which focuses on acquisition strategy in the supply chain sector, said consolidation is accelerating because demand for freight forwarding and other logistics services is growing faster than the overall economy. With the industry consolidating and capacity tight and expected to get tighter, organizations must use due diligence in finding core carriers to support their supply chains. The United States is temporarily easing trade restrictions on Myanmar by allowing all shipments to go through its ports and airports for six months, an effort to boost the Southeast Asian country's opposition party after its landmark election win in November, U.S. officials said recently. The policy change, coming after Aung San Suu Kyi's National League for Democracy (NLD) won a landslide victory in Myanmar's first nationwide free elections in 25 years, applies even to ports and airports controlled by entities on the U.S. sanctions blacklist, the officials said. To bolster Myanmar's transition to democracy after decades of military rule, U.S. officials began lifting sanctions against the country after a civilian government was formed in 2011. But officials acknowledged that remaining U.S. sanctions against those with ties to Myanmar's military have had the unintended consequence of halting "many, many dozens" of shipments. Reuters reported in November that major U.S. banks, such as Citigroup, Bank of America and PNC Financial, were shying away from backing Myanmar trade after discovering that the Asia World port — one of the country's most important shipping terminals — is controlled by a businessman on America’s sanctions blacklist. Exporters use trade finance from banks to ensure they get paid after shipments arrive, and the banks’ withdrawal has led to a sharp decline in U.S. shipments into Myanmar. Officials cautioned that while the policy shift allows financing of shipments through blacklisted trade hubs, banks are still barred from doing business directly with the banned firms. The official said the banks’ freeze on much of Myanmar’s trade with the West was most punishing on regular Myanmar citizens. Years after the U.S. began to lift its near-total ban on trade with Myanmar, more than a hundred people and companies remain on the U.S. sanctions blacklist, some of them the country's biggest economic players, creating a minefield for Western businesses seeking to profit from the new openings. U.S. officials said they would likely consider an extension of the sanctions relief in several months. After World War II, an era of Peronist populism and direct and indirect military interference in subsequent governments was followed by a military junta that took power in 1976. Democracy returned in 1983 after a failed bid to seize the Falkland Islands (Islas Malvinas) by force, and has persisted despite numerous challenges, the most formidable of which was a severe economic crisis in 2001-02 that led to violent public protests and the successive resignations of several presidents. Argentina benefits from rich natural resources, a highly literate population, an export-oriented agricultural sector, and a diversified industrial base. Although one of the world's wealthiest countries 100 years ago, Argentina suffered during most of the 20th century from recurring economic crises, persistent fiscal and current account deficits, high inflation, mounting external debt, and capital flight. A severe depression, growing public and external indebtedness, and an unprecedented bank run in 2001 culminated in the most serious economic, social, and political crisis in the country's turbulent history. Interim President Adolfo Rodríguez Saá declared a default — at the time, the largest ever — on the government's foreign debt in December of that year, and abruptly resigned only a few days after taking office. His successor, Eduardo Duhalde, announced an end to the peso's decade-long 1-to-1 peg to the U.S. dollar in early 2002. The economy bottomed out that year, with real GDP 18% smaller than in 1998 and almost 60% of Argentines under the poverty line. Real GDP rebounded to grow by an average 8.5% annually over the subsequent six years, taking advantage of previously idled industrial capacity and labor, an audacious debt restructuring and reduced debt burden, excellent international financial conditions, and expansionary monetary and fiscal policies. The economy in 2010 rebounded strongly from the 2009 recession, but has slowed since late 2011 even as the government continued to rely on expansionary fiscal and monetary policies, which have kept inflation in the double digits. The government has taken multiple steps in recent years to deal with these problems. It expanded state intervention in the economy throughout 2012. In May 2012, the Congress approved the nationalization of the oil company YPF from Spain's Repsol. The government expanded formal and informal measures to restrict imports during the year, including a requirement for pre-registration and pre-approval of all imports. In 2014, the government also took some measures to mend ties with the international financial community, including engaging with the IMF to improve its economic data reporting, reaching a compensation agreement with Repsol for the expropriation of YPF, and agreeing to pay $9.7 billion in arrears to the Paris Club over five years, including $606 million owed to the United States. At the same time, the Argentine government in July 2014 entered a technical default on its external debt after it failed to reach an agreement with holdout creditors in the U.S. The government's delay in reaching a settlement and the continuation of interventionist and populist policies are contributing to high inflation and a prolonged recession, according to private analysts. It is likely that these attacks were the direct consequence of France’s Middle-East policy, including France’s direct military involvement in Lybia’s Civil War back in 2011 and more recently, France’s hawkish attitude toward Syrian President Bashar Al-Assad and the large scale of its intervention in Syria. Three days after the Paris attacks, French President Mr. François Hollande addressed a joint session of the French Parliament at Versailles. In a landmark speech, Mr. Hollande declared France “at war with ISIS” and he laid down the gauntlet to Brussels to adopt a series of controversial security reforms that have long been blocked by civil liberties campaigners and will stretch the Schengen Agreement to its limits. Warning of the looming “deconstruction of the European Union,” Mr. Hollande demanded new powers to stop arms trafficking and a Europe-wide passenger information system to be adopted “by the end of this year”. He went on to list his demands, all of which France had first requested after January’s Charlie Hebdo attacks in Paris, but became bogged down in the Brussels bureaucracy and privacy concerns over the summer. These include arms trafficking controls, the implementation of “sophisticated and coordinated controls at the borders” and implementation of the so-called “passenger name record” (PNR) system that collects extensive bulk data on travelers inside and outside the EU. As well as reforming Europe border procedures, Mr. Hollande announced plans to beef up France’s own security forces at home by creating 5,000 new police officer positions, and several thousand more in intelligence, customs and judiciary. He acknowledged that the plans would put strain on France’s public finances and break European stability pact rules that require Eurozone states to run deficits of no more than 3 per cent of GDP. “The security pact will overcome the stability pact,” he said. As the search for the missing attacker continued, Mr. Hollande also announced he would request a three-month extension to France’s draconian state of emergency powers, revealing that French authorities had already put 104 people under house arrest and conducted 168 warrantless searches. Military force will make the rest of the world safer in the short run, but critics are right that Islamic terror will end only when the Middle East lives in peace. The parallel aim, therefore, must be for regional powers to stop fighting through their proxies, and for the creation of federal states in Syria and Iraq that give Sunnis, Shias, Alawites and Kurds confidence that they can live together with decent representation in government. That requires strengthening the administration in Baghdad. And it means bringing an end to Syria’s civil war. Assembling a UN-mandated force using Turkish, Saudi and Gulf Arab troops would play an instrumental role in stabilizing a Sunni region that threatens them — directly in the case of Turkey, which has itself been the victim of IS terrorism. Mr. Obama and other Western leaders have an incentive to shepherd such an alliance, because, if that scheme fails, a military campaign would depend on troops from NATO. Unfortunately, such a deployment still lacks political support. ISIS pulls an estimated $79M a month in revenues, including $34M in smuggled oil and gas money. The remaining $45M comes from confiscated properties ($24M), taxes ($17M) and electricity ($4M). “The terrorists depend for their revenue on the control of oil,” said British Defense Secretary Michael Fallon. “Cutting off their finances is extremely important to degrading the terrorists, to undermining their campaign in Iraq, and to shrink their operations in eastern Syria.” The British government declared that four Tornado combat planes had bombed the Omar oil fields near the Iraqi border at the beginning of December. The site represents about 10% of potential income for Islamic State, the government said. It’s a good start, but much still needs to be done in that area. In voters’ minds, Islamic terrorism and large-scale immigration seem to blend together, perhaps because the parents of some terrorists were themselves once migrants, perhaps because both denote a state that cannot control its own territory. Mainstream politicians, fearful of the populist right, seem reluctant to challenge such perceptions. But they have a duty to defend the values of a free society — if they want to live in one. The logic of turning away refugees is deeply flawed, practically and morally. Clearly, there is a risk of infiltration, and Europe should monitor new arrivals. But at least five of the Paris terrorists were European citizens, not refugees. Someone determined to blow himself up in a terrorist attack could always pay a people-smuggling network to get him in. Some of the refugees arriving on Greek islands were themselves the victims of jihadist violence, occasionally at the hands of Europeans who went to Syria to join IS. For Europe to put up a wall to Muslims would suggest that, as IS says, Europeans despise them all. That could be a pathway to terrorism, too. If your business is looking to expand beyond the U.S., effectively managing your organization’s growth will depend on your ability to design and implement appropriate international funding solutions. Use these six strategies to help your business tackle the challenge of creating an optimal international banking structure. We see it all the time. When an organization expands overseas, its treasury department may encounter the daunting task of developing a banking structure that not only improves visibility and enhances control but — most importantly — maximizes efficiency. Treasurers face increased pressure to integrate operations and centralize management of disparate supply chains across multiple continents. Whether your company is in three countries or a dozen, effectively managing your organization’s growth will depend on your ability to implement appropriate international funding strategies and solutions. While every industry and business faces unique challenges, we tend to see growing companies make similar mistakes when they expand internationally. Using these six strategies can help your treasury avoid the common headaches of international banking and get an optimal international banking structure up and running. There is no one-size-fits-all model to international banking. When developing a structure, consider your business’s trajectory and the long-term goals for new overseas operations—and consider the scenarios when centralization makes the most sense. If your operations are primarily focused on serving needs at home, a high degree of centralization may be appropriate. For example, if a new operation in East Asia is exclusively engaged in supply chain management, then a banking structure that places all decision-making authority with the North American headquarters would be ideal. But if a business intends to make inroads into markets abroad, a less centralized model could provide a greater degree of flexibility and responsiveness to local needs. Centralized decision making may not serve your business well if you’re prioritizing it over your ability to adapt to regional needs. For instance, a treasurer’s first tendency may be to embrace the maximum amount of centralization possible, as it facilitates the goals of visibility and control. But not every decision needs to be approved at the home office, and a structure that prioritizes centralized control over regional flexibility can hamper growth, as well as create regulatory headaches. In some cases, leaving greater room for autonomy in regional banking structures can facilitate future growth, especially if your business’s focus eventually shifts towards high-growth markets abroad. In order to execute your treasury agenda, gaining senior-level buy-in is crucial. Optimizing your banking structure will likely require resources and cooperation from a variety of stakeholders. Before starting the project, you should prepare a solid business case that shows the shortcomings of your current structures, as well as the potential risks and rewards of your proposed modifications. Clarifying the project’s KPIs beforehand will help set you up for success when tracking the program’s performance, ensuring that support doesn’t fade midway through implementation. Throughout the project, maintaining a constant focus on your structure’s KPIs in improving visibility, gaining greater control and reducing costs can help ensure buy-in from crucial stakeholders. Rationalizing accounts through an integrated global banking structure can provide numerous benefits. Consolidating accounts among a handful of banking partners may allow you to minimize counterparty risk, reduce borrowing costs, negotiate lower transaction fees and centralize control over banking decisions. Account rationalization may also provide opportunities to leverage banking technology and adopt automated controls that can enable advanced treasury structures. The creation of payment and receivable factories, or the adoption of cross-border notional pooling, may be far easier when your accounts are fully rationalized. In-house banking: The creation of an in-house bank can provide highly centralized control over funding decisions while also allowing subsidiaries to maintain responsibility for routine operations. Creating a centralized entity that can manage intercompany loans and makes investment decisions on behalf of subsidiaries can allow headquarters to maintain more control over the flow of funds, while interfering less with routine business functions abroad. Payment factories: Attaching payments and receivables factories to an in-house bank can provide centralized control over operations as well. By routing every invoice through a payment factory that transfers funds on behalf of your subsidiary, you can increase visibility over all aspects of the subsidiary’s operations, from supply chain sourcing to final sales. A payment factory also creates an opportunity to implement a set of automated controls that govern routine spending decisions. Shared service centers: Alternatively, creating shared service centers can provide foreign subsidiaries with access to company-wide resources, centralizing key operational areas while maintaining a decentralized local funding structure. This can be advantageous for subsidiaries operating in nations with tight currency controls or unusual regulations that make international financial integration problematic. A shared service center allows a subsidiary to retain local banking services while still leveraging corporate expertise to manage complex operational areas such as human resources, IT or purchasing. The degree to which you’ll be able to consolidate financial structures among international operations will likely vary significantly between regions. For example, operations in Europe are ideal for creating highly integrated structures. Every nation in the SEPA region has adopted a standardized set of regulations that make integrated banking operations simple and efficient. On the other hand, treasurers trying to consolidate banking structures in Southeast Asia or Latin America are faced with a daunting patchwork of national regulations and currency controls, as well as foreign exchange risks. The transaction costs and regulatory burden of an integrated banking structure in these regions may prove prohibitive. In short, your banking structure should be capable of accommodating regional variation, while taking advantage of opportunities to reduce transaction costs and increase oversight through centralization. As your business grows, it’s important to take a critical look at existing banking structures and make sure they’re developing in alignment with global policies that govern foreign exchange, debt and cash flow management. A clear and comprehensive policy is especially important for businesses that have adopted a relatively decentralized, autonomous approach to banking for foreign subsidiaries. A universal policy that sets risk management guidelines and cash flow goals for the entire corporation can help local subsidiaries make proper decisions while operating autonomously.